Friends and followers! Two months ago (the 10th of march) I was very fortunate and lucky to attend the release event of Highland Park ICE at the Edrington head quarters in Stockholm, Sweden! 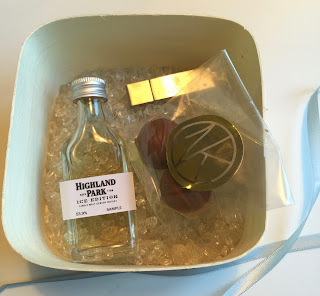 I think you can all imagine that I was pretty excited to be one of the first people in Sweden, in the good company of other bloggers, whiskywriters, connoisseurs and guests, to try a new whisky from Highland Park Distillery! When we entered the tasting room a beautifully decorated table met our eyes. 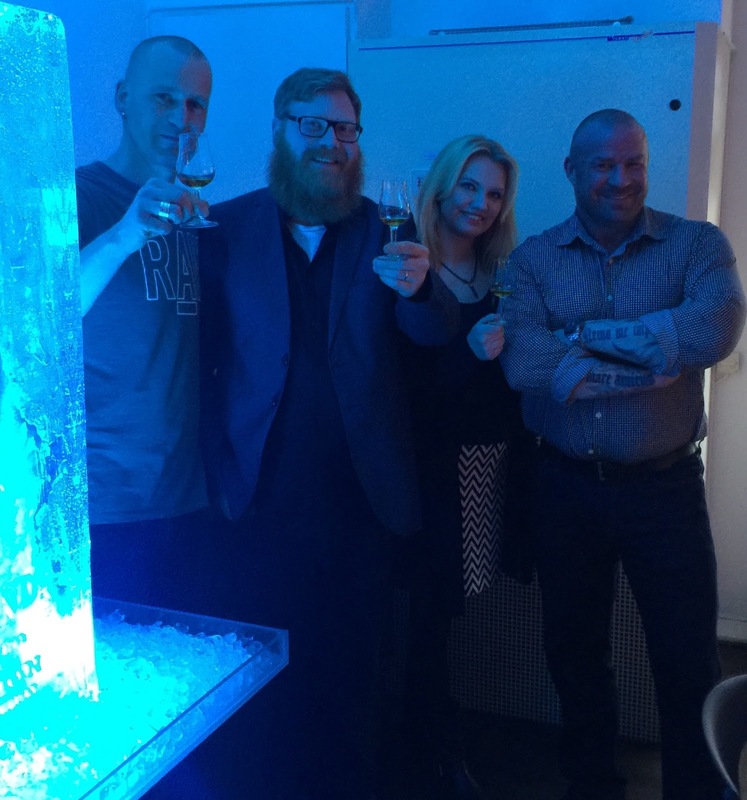 Especially cool was, standing at the back of the room, the visually attracting BIG cube of Ice, with an actual bottle of the new whisky frozen in to it, cool right?! I soon understood that we were not only going to taste ICE but also five additional whiskies from HP. 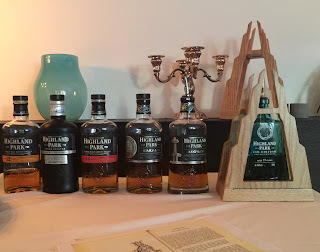 The line-up consisted of 12yo, Dark Origins, 18yo, Harald, and Sigurd (followed by ICE). In my opinion, Dark Origins definitely kicked the living crap out of the other four first whiskies. (ICE did the same with the entire line-up!). the line-up of the evening! Guiding us through the tasting and the release event, of course was non other than the very entertaining and highly knowledgeable Senior Brand Ambassador, Martin Markvardsen. Yes, it has an age statement; 17yo, but moving all the way up 19yo. The strenght is 53,9% ABV (vatting strength rather than cask strength). 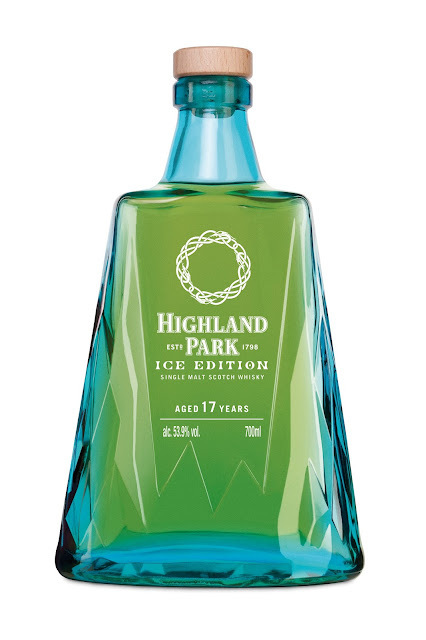 ICE has been fully matured in firstfill bourbon casks, namely 250 litre hogsheads that has been rebuilt from 200 litre barrels. AND (!) the ends/lids of the casks consist of new american oak. Here in Sweden, 1400 bottles (out of 30k worldwide) will be released this Thursday at the swedish state monopoly (direct link here). It will cost 1999kr (approximately 200 euros). 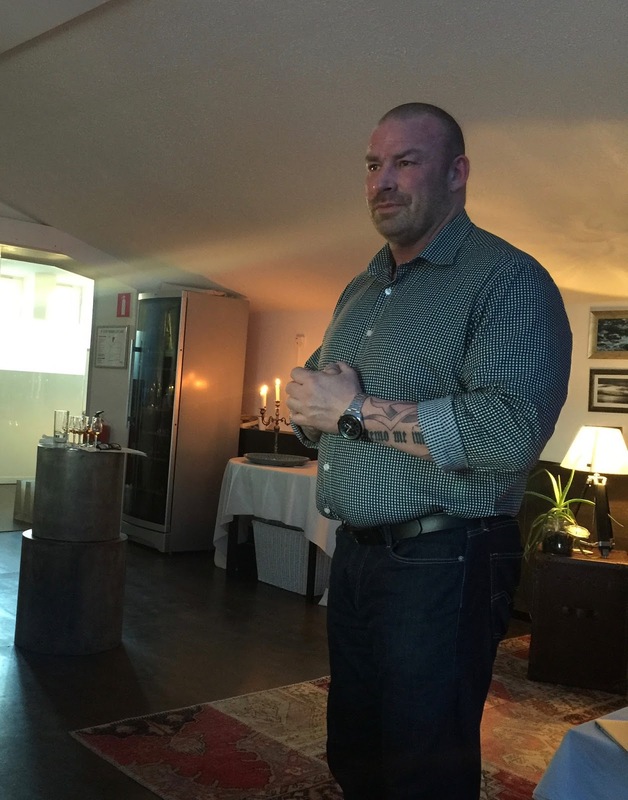 and given the fact that some time has passed and the release here in Sweden is getting closer, I decided that it was time to do a second, in-depth tasting and share these impressions with you dear friends and followers. So here we go! The thing that first appears on the nose is that ICE is very, very, very rich on fruits. First and foremost ”tropical” fruits, in this case being peach (peach jellycandy), passionfruit, lemon and lime, even lemon jucie and/or lemon curd. We also have some really floral stuff. There’s also red apples and a slight touch of very ripe pear. Below the fruity layer is quite a big whiff of vanilla, light honey and also some almond paste. I would’nt say that there is much peat though, if there is peat in there, i’d say it’s presenting itself as something quite distant/fleeing, maybe moving towards leaves and bog, the early stages of autumn… very intriguing nose, a great experience just to nose this one in fact… (mmm, dreaming away…). But, I have to taste it of course! an actual bottle of ICE! The nose does not at all reveal the power that is about to hit you on the palate! The explosion of tastes on the palate kind of sneeks up on you. All in all a really interesting dram that shows two very, very different sides of what Highland Park is or can be all about! A great dram for sure! Big thanks to Martin and to the nice people at Edrington for inviting me to attend this release event, and for the goodie bag! 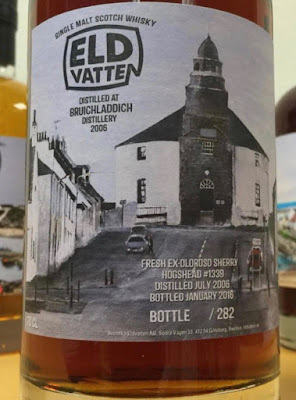 Svenska Eldvatten – Bruichladdich 2006 9yo single fresh ex-oloroso sherry hogshead no. 1339! now isn't that an incredible color?! Friends and followers! 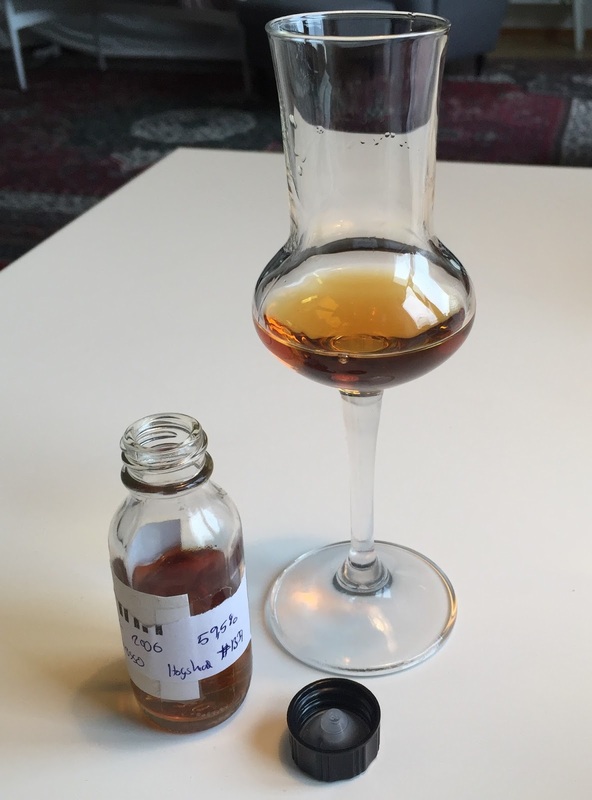 Once again I am very happy to be able to bring you my impressions of a coming release from swedish independent bottler "Svenska Eldvatten" (Swedish Firewater). This time it's the third release in their anniversary-series with which they are celebrating their first five years! As I've shared with you before my dear friends and followers, every release in the series has a very special and exclusive label showing a motif painted by the well-known artist/painter and whisky-aficionado alike, Petri Jäsperi. This third release was distilled at Bruichladdich Distillery in july 2006 and bottled in january 2016 at 59,9% ABV. The whisky has been matured in fresh ex-oloroso sherry hogshead number 1339, and the cask gave 282 bottles out of which 250 will be released tomorrow at 10 o'clock. People in Sweden can order this bottling by following the instructions given here. Ok, let's see what we they've chosen this time! Absolutely enormous and gigantic whiffs of dried figs is the first thing that springs to mind! Or rather, it really is there, there’s simply no way to not notice it or pick it up! I’ve never felt this much dried fig before! There’s also GREAT amounts of vanilla and dark raisins. Dark milk chocolate, coconut, rhum-raisin filled pralines, overripe banana, dark dark dark rhum (almost Diplomatico-style), there’s even something cognac-esque going on here, the list goes on and on… To imagine what this whisky is like, take everything you think of when you think of a heavily sherrymatured whisky, now multiply that at least four times! I’m not kidding! It’s so big. The intereseting thing with this incredibly big sherrynose is that it’s not too much, and it’s not in any way nasty, soo incredibly soft and well-balance. It’s soft on everything, especially the figs, the vanilla and the raisins. In the very top layer is something like lime and brown dark raw-sugar… that’s been covered in sugar ☺ So far, I have’nt fealt any peat at all, let’s se if there's any on the palate! I’ve never felt this much sherry-influence before in a whisky, at least not this intence, this must’ve really been a really fresh sherry hogshead indeed. The guys at Svenska Eldvatten sure knows how to pick ’em, impressive work! Big thanks for the opportunity fellas! Sláinte!